Israeli first division side, Maccabi Tel-Aviv, has finally taken the lid off the much-talked-about allegation of theft involving Hearts of Oak player, Bernard Don Bortey. This follows lodging of a formal complaint with the Ghana Football Association (GFA) to end weeks of speculation on the matter. According to a fax sent to the GFA dated June 3, 2004, and signed by club vice president, Eli Drix, Maccabi Tel-Aviv pointed out that Don Bortey was caught stealing from the team's dressing room during recent trials with the team. "From the day that Don Bortey arrived, various sums of money and a watch were stolen, while before his arrival no incident like that happened", it stressed. According to the fax, Bortey took advantage of the benevolence of compatriot, John Paintsil, who took it upon himself to convey him from the hotel to the training grounds, and stole about US$650 (almost ¢6m) and a watch from the team's dressing room. 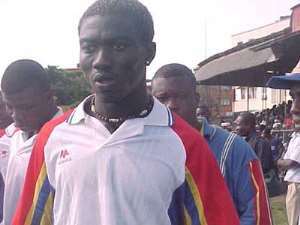 It alleged Bortey then concealed the stuff in his training shoes and hid it in Paintsil's car to avoid detection. The Israeli club simply disclosed that they have enough evidence in their hands to prove that Bortey stole the money. They, however, exonerated Paintsil from the case. "We would like to declare that John has no connection to this incident", they put it bluntly. "John is a very appreciated player in the team in the social and professional sides, and has a good chance to be nominated to be the captain of the team next year", the fax revealed. The club did not hide its appreciation for Ghanaian players and noted that Don Bortey' s behaviour was quite unlike players from Ghana. "We reject all publications in the media in Ghana about the part of John Paintsil in this incident and emphasise again that John was not connected to the incident", it stated. Meanwhile, efforts to get Don Bortey for his side of the story have proved futile.